When Mercato was constructed in 2009 in Naples, it was the first of its kind living and shopping venue in Southwest Florida. It is one of the many pedestrian-friendly, mixed-use neighborhoods that are now in major, upscale communities and tourist destinations across the country, but with consistently better weather than many. Graced by streets constructed with pavers and restricted vehicular access, the first phase of Mercato construction included 330,000 square feet of retail space, 92 condo units, and 110,000 square feet of Class A office space. 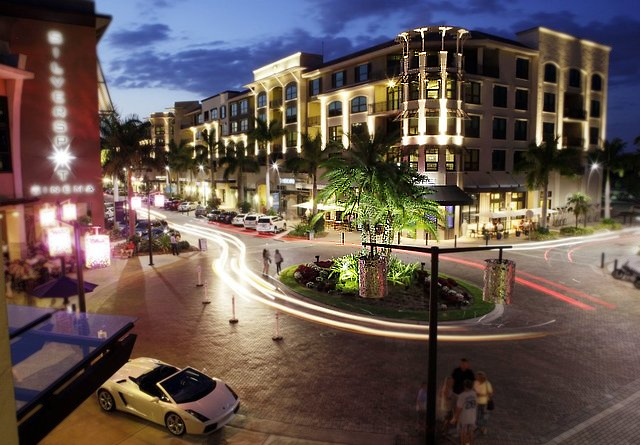 Mercato is a residential, retail, restaurant, and entertainment district that typifies the good life that is Naples. Its upscale shops and world-class eateries make is an attraction as well as a destination. Mercato Listings - Updated Every 15 minutes! The Strada at Mercato is the enclave of the original 92 one-, two-, and three-bedroom condominiums nestled in the four levels above retail in two of the buildings. In addition to their homes, residents enjoy a 52-foot, private, rooftop pool and spa next to a state of the art fitness center. Residences range in size from 1,000 to 2,000 square feet. The Residences at Mercato is the latest addition to the community. It is a gated enclave of single-family homes and villas designed by local Naples architect, Matthew Kragh, and featuring a “contemporary coastal” concept. Mercato Way runs parallel to and along the length of the shopping district. Homes range from 2,500 to more than 3,500 square feet and are available in five different floor plans. The Azure has three bedrooms and three-and-a-half bathrooms within 2,697 square feet of living space on two levels. The Master Suite is on the main floor. Two separate bedroom suites occupy the second floor. Le Ciel is slightly larger, with 2,831 square feet of living space, including three bedrooms and three-and-a-half bathrooms on two floors. A spacious loft area is on the second floor. A covered entry adds a touch of convenience. Entry into the residence from the garage is through a laundry and storage area that also features a powder room. Provence is a four-bedroom, four-and-a-half bathroom with 3,118 square feet of living space. This model has two one-car garages, each with access through the laundry room and into the kitchen. A built-in grill is featured on the lanai. Le Jardin is another four-bedroom, four-and-a-half bathroom option with 3,250 square feet of living area and a two-car garage. The floor plan is similar to the Le Ciel, with an additional bedroom and full bath on the second floor. Le Rivage features 3,558 square feet of living space with five bedrooms and five-and-a-half bathrooms. Each of the models may be customized with a variety of interior and exterior options. School age young people typically attend Pelican Marsh Elementary School, Pine Ridge Middle School, and Barron Collier High School. Mercato is ideal for those who want to be close to all the amenities and action that Naples has to offer and who want to do it in style.